We have a saying, here in Great Britain, which is said to someone you haven’t seen for a time. It’s: ‘Well look what the cat dragged in!’, and it seems pretty apt right now, for I haven’t been able to blog for almost 4 weeks. FOUR WEEKS! And …. I haven’t even brought a note from my mother either! Tsk tsk. (more about why I haven’t been, in a minute). Well … I’m here, dragged in by the cat (so to speak), and sharing a little thing I actually made during July. I photographed it … and then couldn’t find where I’d saved the photos, so I’ve ended up photographing it all over again, so that I could come and share it with you. It’s called: The Little Cottages at the Harbour. I have a small bundle of driftwood, here in my craft room. It’s all incredibly lovely to handle – so smooth and has its own story, a life as being part of something else – I’d love to know what, but that’s a secret kept only by the sea. The sea did what the sea does and made this wood something incredible, but now I needed to give a piece of this driftwood a new life to lead. I sat with a little piece of it on my desk for a few days before finally deciding that it would be a base for some little fishing cottages that would be found by the sea – perhaps not quite as close to the sea as I’ve put them here, but a little artistic licence came into play in the creating process as I very much wanted to include a boat in the scene, so water was (obviously) a must! see the sea-foam where it’s splashed up the bottom of the boat, and is slowly ‘dripping and draining’ away again? The houses and the two seagulls (stood having a chat on the top of one of the houses) I made from clay. The clothes hanging on the washing line were all cut by hand, from felt; and the grass, the slate pathway, the wet looking sea with its sea-foam, and all the other various bits and pieces, were all made from things I have knocking about my craft room, all stored in wee little pots, just waiting for their chance to pop out and play. a view around the back of the little cottages. The whole thing measures just 5.25″ long (or 13.3cm) and 1.75″ wide (4.4cm) at its widest point. Well that’s the crafty bit over and done with … now comes why I wasn’t at school for ages. So … if you only came to have some crafty joy, please stop reading now. Those of you who are gluttons for punishment, read on…. I shall put it all in as few words as I can: An ongoing, long-standing medical problem is being a problem, but after six and a half years with my new doctors sending me for test after test; so many x-rays I swear I glow in the dark; huge great hollow needles being shoved into my hands (had to mention that one as it horrified me when I saw what they were about to do), which was testing nerve responses; and so much blood taken from me for tests that I now put every phlebotomist under the one title of: ‘The Dracula Brigade’ – … I’ve finally been diagnosed with Fibromyalgia – which, for those who don’t know what it is, is a disease of the central nervous system. For years I’ve been blaming my spinal injury (result of a RTA some years ago) for all these things that had begun to happen, and they were getting worse and worse and driving me crazy, but it was something else which was happening all the time! Apparently Heaven is determined to get its hands on me and is wearing me down, one injury, one illness, one ‘broken’ bit at a time, until I eventually give in or give out! Then . . . the oven [in the kitchen] decided to turn up its toes. Then . . . the dishwasher apparently couldn’t cope with life without the oven and it died of a broken heart. Then . . . Mr.Cobs, in his attempt to get the dishwasher out of the kitchen, manoeuvred it out of its hole which it lived in, (under the work top). He got the machine out but then had to crawl into the now vacated spot to unplug the dishwasher from the hidden electrical socket …. and upon completing the unplugging task, he was backing out of the space …. thought he’d backed out far enough and . . . lifted his head . . . only to find that he’d misjudged the distance and WHAM … he hit the top of his head on the underside edge of our wooden, 2″ thick work tops and cut his head open! OH MY GOODNESS!!! SOOOooooo much blood! Clean tea-towel after clean tea-towel came into use and I folded one into a firm pad and gave it to Mr.C with the instructions of putting it on the cut and holding it firmly in place. I managed to get him to a comfortable place to sit (I was scared silly that he’d pass out on the floor, as this is not a weedy chap we’re talking about here. He’s a tall, meaty chap and there would be no way I could pick him up or drag him anywhere! After asking him various questions (who’s the Prime Minister of our country. What year is it. What’s his date of birth etc) to establish that he was still in mental working order, I feared to look but knowing that I had to . . . with torch in hand I carefully examined the site and found that damage was a small cut of less than half an inch! From the amount of blood I honestly thought that there would be a huge gaping gap of around 4/5 inches. I’d already planned to call an ambulance as I feared him bleeding to death if I drove him in the car to the hospital. He suffered a bit of a headache (as you’d expect) but a couple of pain killers and sitting quietly for a while made him feel a little better. And … the blood flow stopped … which I’m guessing is down to the amount of prayers I shot out of my heart and head from the moment I saw the blood dripping down his face. Rest assured though dear reader, he is perfectly fine and totally groovy now. Of course, while all the above was going on, normal life was also taking place – as it does – but somethings got left, pushed to one side, or put on the back burner, and sadly blogging was one of those things. Sorry about that. I don’t know what’s going on this summer. Is it the heat? Is it the fact that we in Great Britain aren’t used to this amount of ‘Summer’ happening all at once? I have no idea. I only know that this Summer has [personally] brought trouble with it and I’ll be really rather glad to see the back of it. I’m looking forward to Sunday, 23rd September – for that’s the official date that Autumn begins here in the UK, and from that date I’ve decided that there will be no more trouble. Autumn is one of my most favourite times and I’m in talks with God about how life hasn’t been very fair recently. God, though, has an answer for everything – and says if not me, then who? And I and my heart truthfully can’t answer that one. Anyhoo . . . I hope that you haven’t met with any problems or even disasters, which were too much for you to cope with. Remember – into each life a little rain must fall, so don’t feel that you’re alone when something happens out of the blue which you would rather hadn’t happened. I can guarantee that at least one other person reading these words as you read them right now, will have gone through pretty much the same thing and can relate to how you feel. So . . . If you’re going through ‘it’ … we’re all standing right beside you, cheering you on and shouting words of encouragement. You’re not alone. We’re right here. Thanks for coming and taking a peep at the Little Cottages at the Harbour, and having a read of this ‘diary entry’ for what happened in August! It’s truly great to see you. I’ve missed you all so very much. Previous Fairy Footprints Card ~ Fairy Cottage Pot ~ Birthday Giveaway Winners! Next Birthday Greetings … of the Hare(y) kind! We say the same in the USA. Just to let you know that English is all at once universal and divided, because we also say we could give a you know. I’ve been caught out on (what I call) British’isms’ before so try to remember that I’m chatting with the whole world here and so explain anything I think might confuse. You’re absolutely right Tony, English is all at once universal and divided. How wonderful to have you back! I’m sorry to hear of your medical problems and glad the doctors had a diagnosis. Also, it’s great that your husband’s knock on the head was not as dire as you thought at first. Loved the little cottages, as sweet as can be. Hope you will be feeling better in the weeks to come. Ahh, bless you Anne. You are so kind. I am certainly very thankful that Mr.Cobs head injury wasn’t as bad as I initially thought it was (from the way it bled I truthfully thought that this was a major injury!). Tickled that you loved the little cottages. Bless your heart for coming, and for the lovely message. Aw it’s great to see you, my lovely friend. You’re on the button with the ‘Ughh’ for the month of August. It began to feel almost like I was having a bad dream and would wake up soon. I’ve missed you lots too. Heaps! Thank you for your thoughts and positive vibes. Every single one of them is very much welcomed. I’m so glad you like the Little Cottages at the Harbour, and especially the smoke coming out of the chimney. That was a random ticklish thought that crept into my head and before I knew it, it was done! Thank you so much for coming Tam. It’s wonderful to see you after what feels like forever. Goodness ~ you don’t do things by half do you?? Hello Mrs P. How tickled I am to find you here. I’ll put the kettle on. Fancy some toast? Do things by half? Why do it that way when you can chuck it all into the mix?! [sigh]. I’m still in a kind of ‘shock’ situation about all the things which arrived during August. We all expect to deal with everyday stuff, and the odd spanner thrown into the mix – but when some unknown force throws the entire contents of the B&Q Tool Section in, all at once … well that’s just “having a laugh” as the saying goes. Thank you for coming P. I love you to pieces for taking the time to chat, and for the hugs and wishes, and the acknowledgement of my plate spinning skills. Never knew I had those. lol. I think I should have a framed stifficat for that! Tickled to my toes that you like the cottages. Ohhhh …. Hello Heather, and the fabulous Dizzy of course! It’s lovely to see you. Trust you are keeping well. I shall be over to your blog in a while to check out what’s happening. I shall leave likes on old posts that I’ve missed so that you know I’ve been and read. I’ll only comment on the most up to date post – so that you don’t have a selection of comments to try and answer. I’m thrilled that you like the little cottages. Bless you for coming Heather. It’s so lovely to catch up with everyone again. I went over to your place earlier …. and read your news about Brock. So desperately saddened. I tried to read it out to Mr.Cobs and cried through half of it. The new style is very swish and rather smart. I’m impressed big time, Heather. It all looks very welcoming and stylish, and really well laid out. Love it. Well done Heather. Great job. It will be good for you to have a few days away. Another four walls is sometimes all you need to help you come to terms with those things which cause us anguish and pain. Cobs, what a beautiful little piece of driftwood art! Sorry to hear your summer has been so trying. Fingers crossed that a diagnosis means that they will stop poking & prodding you. Hugs to you! Thank you SO much for coming Kathy; for the lovely comment and for the hugs. Hugs are always welcome! Its good to see you back Mrs Cobs. 😊 I am so glad Mr Cobs is recovering well from his ordeal. Mr. Cobs has fully recovered, thank Heavens! Flipping heck, I was SO worried when I saw all the blood he was losing. I was stunned at how well I kept it together and stayed so calm, because inside, I was panicking like I've never panicked before. He's so much a part of me that anything happening to him is, I swear, beyond anything my heart could possibly stand. Aw I'm thrilled to bits that you like the little cottages. Like you, I'm a sucker for the sea too. Thank you for your Autumn wishes. May September be a good month for you Daisies. Thank you for coming and for the lovely comment. Bless your heart. Cob, We seem to be two peas in a pod. My oven door want close and the dishwasher died a long while ago and without removing the floor we can’t get it out. …there is more…Your glow -in-the-dark I really do understand. Back in 2001 when my DH was so sick and they couldn’t find out the reason he went through every thing you have. I have always been afraid some of that may have caused the more recent problems…not trying to add worry to you . There must be something about a head cut. Number 1 son cut his head recently when one of the gates in the cattle hauler ( big truck) fell on him. Luckly there were other people around, sometime he does all this alone, but he decided to carry on. His cap will never be the same. lol A brand new white one no less. September 23 is too far away…We must claim today the end of all this stuff. Tomorrow, tomorrow the sun will come up and every thing will be better. Make a note! I remember well when your son cut his head open on the gate on the cattle hauler, for I remember the horror as I read about it. A shudder ran through my body as I ‘saw’ what happened in my minds eye. Your oven door wont close and your dishwasher gave up … you’re absolutely right! Two peas in a pod indeedly doodly! The dishwasher … well it’s been moved back into place and I’ve given himself instructions that he HAS to get our SiLaw to help him get it out of the house. I’m not having him causing himself any more injuries. tsk tsk. Aw, I am claiming today … and every day, Bev. But … well, last month . . . I don’t have to tell you that sometimes, a build up of ‘stuff’ can eventually bring you down to a level where you throw your hands up and declare surrender. (so to speak). if there’s a light at the end of the tunnel or not.
. . . and that about sums it up. But, we keep on keeping on and try not to allow anything into our days which causes us to not see all the blessings we actually do have. And … we try to remember that question: “If not you, then who?” – which is the question that you and I cannot answer with a pure heart. So I’ll keep what I’ve got and be thankful that it’s not something worse, or something that someone else might be struggling with. And I know you’re exactly the same. Tickled that you like the the little cottages. They were a joy to make. How are the cards doing at your new swanky place, by the way? Love you to the moon and back Bev. and I promise to keep hanging in there by anything but my neck. LOL. Trying. Yes … this last month has been very trying – and like you say, also expensive! I still continue to give thanks that Mr.Cobs head injury wasn’t as I feared it was when I saw the sheer amount of blood which occurred. Apparently, the head has a lot of blood vessels close to the surface of the skin, so an injury on top of the head can cause a large amount of blood loss … but I remembered from a programme I watched a while ago, that the sort of bang to the head which happened, can be the cause of greater problems, and I think that’s why I was so worried about him when it happened. But … thankfully, the man is made of tough stuff, and he survived his ‘mishap’. phew! I was thinking about you a couple of days ago and wondering how you were. I know that you’ve gone through some bad times recently with one thing and another – so I can fully understand that you want this year over and done with. But … don’t wait till next year Nancee … claim today … or begin claiming tomorrow the moment you wake up. Make a decision to have a better day …. then the day after, improve it somehow. And so on and so forth. Claim the days for your own Nancee. Don’t let them slip by. The Fibro … well I’m currently trying to learn more about it, and also learn how to deal with it so that it doesn’t rob me of days like it’s currently doing. My doctor is really lovely and he’s arranging things that might help, so I have my fingers crossed for some of those things. Even if they don’t all work – at least some of them working will improve life, for sure! Thank you so much for coming, it’s truly lovely to see you, and thank you also for your lovely chatty comment. I’m tickled that you like the little houses on the driftwood. Bless you. Ooh, I’m loving the little cottages at the harbour! You must have had such fun making this. I’m glad you mentioned the birds, because I hadn’t noticed them, but they are so sweet, chatting away to themselves about where they’re going to get the next crust from. So glad you have finally had a diagnosis, but very sorry to hear that your body has been suffering with Fibromyalgia. I have 2 friends who suffer from this and I know it can drive one crazy at times. I wish you peace of mind as you come to terms with this intrusion in your life. And what a life you’ve been having this August! So glad to hear Mr. Cobs is okay after his mishap. If…if it makes you feel any better…at least you didn’t open your front door this morning to find the lino in your porchway teeming with maggots. I spotted a woodlouse by the doormat and as I moved it away to let it pass, loads of maggots emerged crawling about everywhere! I can only presume that is why there were flies buzzing around our door 10 days ago, but there was no yukky bits that I could see. Our cat must have dropped a tiny piece of animal onto the mat, so small that we couldn’t see it, because flies only lay eggs on yukky dead bits of stuff. Anyhow, I was sufficiently grossed out. So now you can waggle your finger at your resident feline friend and tell him to not sneak any pieces of animal or fish onto your doormat, so that your September will be a good one, not a ‘screaming out loud’ one like mine was today. Fibromyalgia … no fun what-so-ever – as your dear friends have no doubt told you. But at least I now know that I’m not going crazy, I’m not imagining things, and nor do I have dementia or Alzheimer’s – that alone was a relief! Oooooo… ewwie…. sorry to hear about your maggot infestation. I was sat squirming as I read your account. Flipping heck … I would have had a difficult time cleaning that little load away! I can’t abide maggots and flies. They bring me to a place of pulling faces and wanting to run away. I’m an absolute terror with flies. Mr.Cobs, bless him, keeps our fly swat nearby during the summer, and I buy those [plastic] ribbon curtain things for the conservatory door, in the hope of keeping the little bu&&ers out during the summer. However, the brazen ones still manage to get through and it’s all action stations when they do. Vile creatures. Landing on things and planting droppings on everything they come across. Grrrr. But … I’m rather glad that you found them while they were still maggots – for once they’d gone through that cycle just think how many flies you would have come across inside your porch! Flipping heck, it would have been like a Hitchcock movie!!! eeeek! Thank you so much for coming Sharon, and for the lovely chatty comment. Great to see you. don’t know about the cards but I am making a few more that she ask for. All I know is me,myself, and I could not afford to buy one at the price she put on them. I am obviously not in her league but hope she has a good following. The price she puts on them Bev, are what she knows they’re worth. You under-value yourself, and your artistic talent. You are amazingly creative and so brilliant at making those flower cards. I still have all of mine (from you) still displayed in my craft room. Every single one of them. (oh – apart from the one with the little tea light. That one’s in the living room). They’re amazing Bev, and I’ve received many comments on them. Everyone loves them. Goodness me Cobs, I too am glad I haven’t been missing your posts. So pleased you finally have a diagnosis, one blessing in an otherwise torrid month. Dishwashers and ovens go together, (obviously!) and clearly yours couldn’t go on without each other. But poor Mr Cobs, I have done what Mr Cobs did, and it is such a shock. I can say that swearing loud and long at the offending obstacle does nothing to help the situation either. But Cobs the dear little cottages and sailboat have stolen my heart, you are so clever. September in England can be a joy, but can also be hot, so I hope the weather takes a turn for everyone who has suffered through this long hot summer. As a complement to your weather it has been a long and unusually chilly winter in Melbourne, but the blossom is on the trees and the bulbs are beginning to show their faces, so it’s all good. I am hopeful the fibromyalgia is something you can manage with med’s. Meanwhile I know you will squeeze every joyful moment out of each day. Yes, August has been a month of one trial after another, and I’m rather glad to see it leave. September is so far (touches wood to her right) going well and nothing to report, so crossing fingers that this situation continues, as it feels so much nicer than what has been. I’m thrilled you like the little cottages and the sailboat. 😀 Between you and me, I think the little boat is possibly my favourite bit. Glad to hear that you are showing signs of the warmer weather to come for you in your corner of the world. Because of the very high temperatures which you get in Summer, I should imagine that when your winter comes along, the drop in temperature must feel really REALLY cold, so signs of summer being on it’s way must be wonderful. The Fibro … I’m in the learning about it stage right now. Trying to help myself to get some sort of routine set up within my life, so that I don’t over-do things (I’m a famous over-doer! ), which then exhausts me and leaves me like a useless thing and in lots of pain. I’m hoping that with time, I’ll find ways of managing it and getting around things I’m finding difficult. Thank you so much for coming Barbara, and for the fabulous chat. love it. The little cottages are adorable! Sounds like you’ve had more than enough trouble and bad news to last a lifetime! Hope you’ve ‘turned the corner’ as we say here in Canada. I can relate to your appliance woes. I’ve had my fridge sitting in the middle of the kitchen for about a month now. A new one is ordered, but it won’t fit in the old fridge space without some cabinet renos – which will probably be completed shortly after the delivery company phones to say the new fridge is on the way. Oh heck … it sounds like you and I are attempting to take over the world with defunct kitchen appliances! I don’t like the sound of the expense about having to have your kitchen cabinets re-organised! All because one appliance turned up it’s toes! Heckaroonie! Let’s hope that the new one you’ve ordered sticks around for an awfully long time. You don’t want to go through that again! Sending squidges, and hoping that everything goes well with the new appliance and re-siting of the units. My goodness, Cobs, you’ve really been through the ringer, haven’t you?! In the long run, it’s good to put a name to these mystery illness. I do hope you get the treatment you need to help feel better. Glad to hear Mr. C’s wound wasn’t serious. The harbour cottages are so cute. Well done! “Through the ringer” … you couldn’t have put it better! Yes, that’s exactly how I feel. But … I’m hoping that September brings a much brighter horizon and that the days continue as they began (on the 1st of Sept.). happier, brighter and less stressed. Mr. C … his wound has pretty much healed, he just has an indent on his scalp. But because he has such thick hair, you can’t see it, so I’ve reassured him that he’s still the fabulously handsome chap he always was. Tickled pink that you like the little Harbour Cottages. To see them with the naked eye is to actually see how cute they really are. The whole scene looks so warm and inviting. Thank you so much for coming Gilly, and for the lovely chat. Enjoyed it greatly! Hello, So lovely to see you back. I had noticed your absence and was hoping that things were ok. It really does sound as though August hasn’t been too kind and I’m sorry to hear of your diagnosis but hopefully things will be better now you know what it is (nothing worse than waiting and wondering). Hello Hannah! Ohhh, it’s such a joy to see you 😀 my lovely friend! You’re right … August was a month which had an attitude problem, and didn’t want to be kind one bit. I’m happy to see it end so that I could mentally kick it out and turn the page and start September afresh. Aw, I’m just delighted from my toes to my head that you like the little coastal scene. It was a total joy to create, and I think it’s all down to my love of miniature. Christmas? ….. ahhh…. well, I’ve already been working on a ‘thing’ or two for Christmas, but I’m not ready to share them yet. There’s still a little bit of work which needs to be done on them both . . . but . . . I have a feeling that you’re going to like them. Bits of fun, and things which make me smile, so I know you’ll smile at them. Thanks for coming Hannah, and for the fabulous coffee moment chat. I always feel like we’ve been sitting together having a good old chin wag when I’m either answering a comment here, or making a comment on your blog. Two artistic minds and hearts chewing things over and ending in a smile. Ohhhh, hello dearest Rabbit. How wonderful to see you. I’ve missed you and have been wondering how things were going relating to the sale of the Rabbit Patch. (I shall pop into the RP and get up to speed (as the young things say) and catch up with the latest news). Thank you so much for coming, and for the lovely comment. Especially thank you for your prayers. They are very much welcomed and I’m so humbled that you would pray for me. Thank you my lovely friend. I’m so happy that you like the little coastal scene with the miniature boat. It was such a joyous time, creating it. Loved every moment. Love you too Rabbit. Bless you for being the beautiful, incredible person you are. I love who you are. I am sorry to hear that you now have fibro. My wee Mum had that, my neighbour has it, my good friend has it, it’s nasty. I have a type of nerve pain that moves around and my skin is painful to touch, almost like a burn, but the doc doesn’t know what it is, mystery nerve pain he say. Aw well, it’s not with me all the time, but nonetheless, it is a bugger. Boy you all have been through some “stuff” lately . Appliances, Mr. smashing his head and you with the aches and pains of Fibro. Growing old is NOT of sissy’s, plain and simple. We have sunny skies here today, but there is a definite nip in the air now. I do love Fall. Thanks for sharing this lovely wee creation. Truly adorable. The Fibro …. you’re spot on Soozy, it’s not a great thing to have. I’m so sorry to hear about the nerve pain that you’re experiencing. Just a thought … have you by any chance suggested Fibro to your doctor as a possibility? It might be worth asking and getting him/her to investigate this option, as the burning and painful skin problems you describe are among the things which I experience too. I’m laughing here but nodding at the same time…. You’re absolutely right. Growing older isn’t for sissy’s. We’ve had glorious weather here today too. Sunny, bright blue skies with a gentle breeze. It was so lovely that we spent the afternoon at the beach with Little Cobs. Today was the last day of his school summer break/holidays, so we thought we’d take him to the beach and just have a ball of a time. When we bought him back to our cottage, he had a play and ate his evening meal, then I gave him a shower and washed his hair so that he was all ready for bed by the time his Daddy came to collect him. Bless his heart, he went home all sleepy but oh so happy. 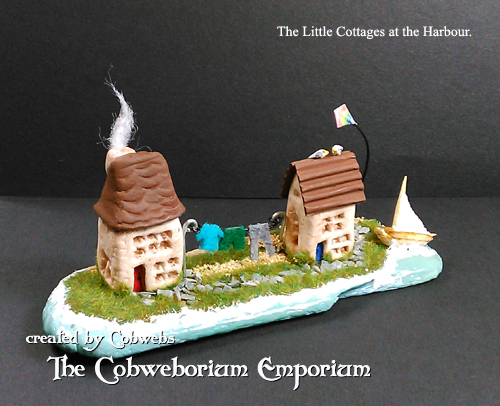 So happy that you like the little Cottages by the Harbour scene. It was so enjoyable to make. Thanks for coming Soozy. Take care of yourself my lovely friend. I’m very thankful and grateful to the Doctor who, after many years, finally made the diagnosis of Fibromyalgia, because I really did think I was going mad. I’d begun to tell myself that it was all in my imagination and that all the shocking pain I was in, and the severe burning feeling I had on the soles of my feet (imaging having your feet supported by the ankles, and then someone coming along and ironing the bottoms of your feet – slowly, to ensure that it covered the whole of your feet – and then imagine how much it would hurt. That’s what it felt like. Then the falls, and the dizzy spells. Bad, bad headaches. The shakes which were getting worse. Oh … and all sorts of silly things. I’d honestly got to the stage of believing that I was either crazy or that it was all in my head and I was imagining it. Mr.Cobs head injury . . . Yes, GASP indeed. Bless his beautiful heart. I’m so thankful that it wasn’t anymore serious. You’re absolutely right, of course, we have good days and bad, and then we have days when it bl**dy pours down. But … August is now over and done with and in the past. September is (at the moment) being very kind and I’m so happy for that. I’m over-joyed that you like the Little Cottages at the Harbour. The ‘scene’ was such an enjoyable make. Thank you Ruthie, both for coming and for your lovely comment, and especially thank you for your prayers – which are very much welcomed. Bless your heart. My word, Cobs, you and Mr C have been through it a bit lately, haven’t you? Hope things level off nice and smoothly for you now. And by the way, I always thought you had a bit of a glow about you, but I thought I was just picking up on your aura… I see golds and oranges and yellows around some folk, and pick this up from you also for some reason. Or maybe it’s just my mind’s eye playing up again. Love those little cottages – I’ve still to get creative with my air drying clay – which has probably dried itself out now, I may just display it as an artistic brick. Dust some (ahem… talkin’ posh for a second) flahr (flour) (hehehe! Spellchecker thought I meant ‘flasher’!!!) on it, and make it into a Christmas brick. Yes, my inspiration is SLOWLY returning. And I’m being silly. I love being daft from time to time, it lifts the mood, I feel. Just chill, Cobs, and post whenever you like. I’m happy with that. It’s good to see you again, though, I hasten to add. Aww, hello lovely Tom 😀 tis great to see you. You’re spot on, Tom. Mr C and I have “been through it a bit” … and I hope that that journey has come to an end! I’m thrilled you like the Little Cottages scene. I really enjoyed making it. Your Air Drying clay … so long as you haven’t opened it, it will be fine. If you have opened it, then always re-wrap it in it’s foil lined package, and then … put it inside one of those zip lock bags (the ones you have to either press to seal along the top – or those one’s with a plastic zip thing which seals the bag – but get out as much air as you can before you make that final little bit of seal up). I double bag mine, just to be safe. If you find, when you’ve played, that you can’t get along with the clay you’re using, buy some Hearty clay – you can buy it in various places, Amazon being one of them. But here’s a tip …. keep either a little spray bottle of water next to you, or a little dish of clean water to one side when using air dry clay. Your hands quickly dry out and this means that the clay will dry out faster than you can create. If and when this happens, simply either do a gentle spray into your palm and rub your palms together to moisten them again – or – dip your finger into the bowl and dab your palms with a little water – again rub palms together to spread the water. Make a simple make. Maybe an acorn, and or an oak leaf. You CAN do this Tom. All that’s holding you back is your fear of failing. But … if you never try – then that’s the only way you’ll fail. Trying is already winning! We all have to start somewhere – and I can remember my first time trying to make something with (real, ‘mud’) clay under the instructions of my tutor (a celebrated, proper sculptor), and I still have that first make. It sits in my garden and I’m really proud of it. Your first make will be a great achievment and one which you’ll keep and display too. Doesn’t matter that it’s not perfect, for it’s only in your eyes that it’s not. Everyone else will see something amazing, created by an artist. Take a deep breath, and begin. Have a little faith in yourself. You’re braver than you think, and you ARE an artist. And yes … if the clay has dried out … make it into a decorative thing. Spray one side of it until it’s wet, then … with something like a pencil or a point(ish) tool – drag it through the dampened clay to turn it into a bricked wall, and then let it dry. You made a brick wall. You can put a mini plant in front of it – maybe a pretend cactus – which will make the wall work for it’s rent free space on the shelf. Aw thanks for coming Tom, and for the fabulous chat. I love having a coffee moment with you – it feels like a fun visit from a great pal, as we put the world of crafting through the wringer. lol. Thank you for your kind wishes and encouragement. Bless your beautiful heart. P.S. . . . LOOOVE the silly. My favourite thing is silly. I *knew* you had a gold aura, Cobs, but considering how artistic and creative you are if I didn’t know I wouldn’t have been surprised! but yes, the blue makes sense as well. That represents healing and calming / nurturing and that is exactly how you come across in your writing. My aura is yellow/orange/red with touches of deep blue and pale green, so I have the creative touch mostly. I also have a black splodge over one of my shoulders, which indicates a blockage of some sort and I have never found out what that blockage is. Most odd, but I try not to let it hold me back! When I finally create something (anything at all!) out of my clay, I will write a post about it, no matter how it turns out. As you say we all have to begin somewhere, so only time will tell what I manage to make. Thanks for the storage advise as well there, knowing me it probably would have dried up overnight with me forgetting to store it properly after using. I like what you’ve done for the new widget. The candle was only one part of the blog, but your redesigning of my header shows more of the, well, header, but *that* covers everything that my blog covers. You could have whatever you like to link to my blog, Cobs, and I wouldn’t mind… I’m just very pleased that you *have* a link to my blog, and I really appreciate it. I see I’ve missed loads of your posts, so I will try and have a flick through your back catalogue, as it were, when I steal myself some more time! The black splodge … could be that you need to forgive – either yourself or someone else. It could be this which is what has been described to you as a ‘blockage’. It’s simply a negative energy – which could be you not forgiving you, or could it possibly be that you can’t forgive someone else? You don’t have to answer here, it’s just me trying to make you think. Anything negative like this, which we hang on to, keeps us from moving forward. Stops us in our tracks and keeps us (sort of) back *there*, (wherever *there* happens to be that the ‘thing’ occurred) – instead of allowing us to continually move forward spiritually, and in life in general. If you can shrug it off – do so. If you need to come to terms with something so that you can let it go – then please try to work on it. Perhaps a spell by a lake – alone, just sitting with yourself and nature, and giving your mind time to push it out and release it into the ether. If you can get to the ocean … anywhere, perfect! I personally find the ocean is the greatest of things to cleanse all that which troubles the mind and soul. You do have the creative vibes – I can 'feel' them. And … perhaps now is the moment that I can remind you that Inktober is heading towards us …. soooo…… 🙂 [grins]. As for missing lots of my posts … I can say the exact same thing about your blog. I'm on a mission to seek and find the posts I've missed – so expect some 'likes' and one or two comments. That of course, is all dependant on me being alive after this evening. My wonderful, much loved dog is far*ing for a place in the Olympics in the hope of winning herself a Gold Medal. She'll win hands down. But … if you don't see me again after this evening, it's because of the Dog and her attempts to gas me. Wishing you a fantastic Friday and a wicked (in a nice way) weekend! It’s so lovely to see you. I’ve been wondering how you are and thinking about you over the past week or so. I even visited your Twitter page to see if you were around. But … I know only too well how it is when you move house and are trying to put roots down. It takes a long time and a bit of work. I hope things settle down into a pattern for you, and that life is truly wonderful there in Styles Towers. Thank you for coming, and for the truly lovely comment. Thank you also for the prayers. They are very much welcomed. Oh, glad you finally have a diagnosis, but I know it isn’t a good one. Hope you get some good treatment. Nice to know Mr C has a hard head! Thank you for your lovely comment and your health wishes. Bless your beautiful heart. Mr.C …. I’ve come to the conclusion that his head’s made of a mixture of wood contained inside a steel shell. Nothing else can explain it! (lol). Draining … yes, it really is. Not knowing what the heck was at the route of all these problems which were getting worse, and worse, was like living inside a pressure cooker. For years I’ve been blaming everything on my spinal injury, and I can see that some things are down to that – but a whole bundle of things just didn’t seem to ‘fit’ the spinal problem. I’m eternally thankful to my fabulous GP who stuck with me and made sure I was tested for practically everything on earth, in order to arrive at the place I’m now at. Laughed like a school girl when I read your comment about the only way being up .. but … “not up when you’re under worktops” LOL! Loved it! Thanks for coming Mrs.Craft, and for the lovely comment. Oh lovely Cobs!! *hugses* for you and Mr Cobs. I’m glad you found out what’s happening, I know it always makes me feel a little better being able to name exactly what’s wrong. It does indeed. You can’t fight an invisible ‘enemy’, because you don’t know what you’re fighting. But once you know, you can begin to set up a plan to make life easier and deal with the problems which are delivered each day. Thanks for coming QWC. and for the lovely comment. Bless your heart.